R2C filters keep our engines the cleanest! We had no engine wear issues in our 2010 WoO rookie year campaign and no engine went less than 1000 between rebuilds. R2C Late Model filters stop more dirt and are simple to maintain! R2C filters feature a specially designed media that allows performance and efficiency to be restored to near new each time by simply using compressed air from inside out, making frequent washing unnecessary in order to restore filter performance. 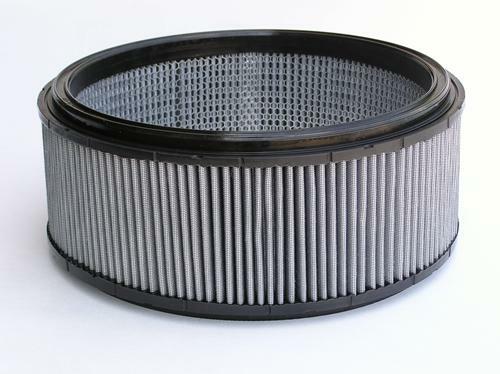 R2C Asphalt Racing filters feature a media that is fully compatible with washing. Biodegradable cleaners such as Simple Green or other mild shop degreasers can be used. Simply place the filter in a light solution or spray the cleaner on the filter. Allow the solution to loosen the particulate and then rinse thoroughly. Shake the filter or use compressed air from the inside outward to remove residual water and allow a full day or two to dry. While the media may discolor and become light gray, filter efficiency and restriction are not affected. * Follow the dilution and application time instructions for light cleaning as indicated by the cleaner manufacturer. 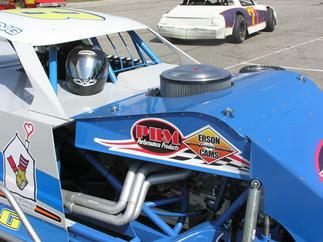 The most powerful Asphalt Late Model and Modified air filter available today! Maximum dust control for unmatched engine protection - 99.3% Efficiency! Simple maintenance and no air filter oiling. Extensive lab and track testing has produced the finest 14 inch and 16 inch competition air filters for Cup and asphalt teams. The R2C pavement racing filter applications reduce initial restriction while providing a significant increase in the ability to stop dust. In comparative testing against current pavement race filters, R2C racing air filters provide teams with efficiency levels exceeding 99% while competitive air filter products produced efficiency as low as 20%! That means that 80% of dust passes through the air filter - wearing valves, cylinder walls and bearings. Count on R2C racing air filters to provide improved lap times and the most consistent A/F quality throughout the event. Fully washable and simple to clean trackside using compressed air, R2C race air filters are the choice of teams demanding the best high flow performance and maximum engine protection. Try one! Fits standard 14" air filter base and lids. Receive the latest news and special offers! ©2011 R2C Performance. All rights reserved.